Two main arms with shaped ends are linked by a flat three-element hinge and are shaped to accommodate each other when folded. There is a shared slit sight at the hinge and window sights attached by wing-headed screws to the ends of both arms, set for lines of sight along the inner edges. The upper faces of both arms have scales 0 to 200, divided to 10, subdivided to 5 with alternate hatching and mirror gilding, and to 1, numbered by 10. The slit sight is mounted on the hinge by a wing nut and when removed reveals the letter 'A' at he end of the baseline scale, and also the number '3' beside the central hole for fixing the sight. The sight is also marked '3'. 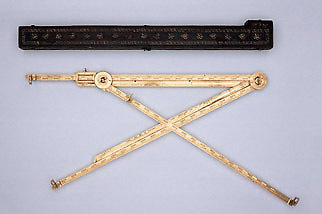 The ends of the scales are marked 'B' on the baseline arm and 'C' on the moving arm, while the holed for the sights and the removable sights are marked '2' and '1' respectively. The numbers of the arms are visible only when the sights are removed. The mount for a pivot for a third arm slides along the baseline arm, with a handle, a rectangular aperture for reading its position on the scale, and is marked with the letter 'F'. The circular end of the third arm is secured to this moving mount by a washer and wing nut, which forms a clamping pivot. The third arm carries a scale similar to the other two, marked 'D' and 'E' at either end, and slit and window sights, the position of the former marked '3' on the arm. The second upper surface of the baseline arm has a 'PLVMBVM' scale 1 to 100 decreasing, divided to 10, subdivided to 5 with alternate hatching and mirror gilding, and to 1, numbered by 10, except that from 1 to 10 the pattern alternates for every unit and the numbering is to 1. The second upper surface of the moving arm has a similarly divided scale marked 'FERRVM'. Underneath the third arm is a third scale for shot, similarly divided and marked 'LAPIS'. The clamping washer for the moving pivot is a disc cur from a sheet of copper with part of a scale and the number '160' visible. Signed on the inner edge of the baseline arm: 'Fecit Erasmus habermel'. Shapes wooden box, lined with silk and covered with leather with gold tooling.